I so love it when I find a place I keep wanting to go back to! This time it’s Yen Linh in Field Street, Adelaide, off Gouger Street near the Central Market. I’m such a huge fan of Vietnamese food, and here you’ll get tasty, more-than-generous serves at a good price. The original Yen Linh opened up in Croydon over ten years ago, and this new one is not only run by the owners’ daughters, Yen and Linh, needless to say, it’s also named after them. It’s a real family affair with dad still running the original restaurant and mum cooking for both. I’d say she’d be one busy woman! It’s casual, with a clean and modern interior. The downstairs gets a lot of nice natural light during the day and there’s also an upstairs section. On first look, it appears to be quite a small place but it can actually seat around 50. The menu’s divided into Small Plates, ‘Wrap and Roll’, Pho, Noodle Soups, Vermicelli Salads, Rice Dishes and Sharing Plates. I like the sound of all of those – hence my need to go back to try everything! I’m such a sucker for Vietnamese quail, so there was no other option for my entrée – BBQ Quail it had to be, and I’m happy to say, I wasn’t disappointed. Beautifully browned and sticky, this bird was cooked to perfection and delicious. This was followed by a huge bowl of Combination Vermicelli Salad. Why choose one thing when you can have them all in one combo? What arrived was a big bowl of vermicelli topped with sugar cane prawn, grilled pork meatballs and spring rolls. At $13, it’s excellent value. My dining partner, who happens to be Vietnamese, chose the Combination Rice Dish which comes with pork chop, shredded pork skin, crackling roast pork and fried egg. It’s a great dish, despite the pork chop being a little overcooked. We walked out very satisfied, if not a little uncomfortably stuffed!! On my second trip, I just had to have the quail again and then this time I chose the ol’ Combination Pho which comes with lean beef, tripe, tendon, brisket and beef meatballs. Loved it. The secret to a good Pho is the stock and this was full of flavour. I’d definitely order it again – but then, how will I ever get through the rest of the menu? Yen Linh is definitely worth a visit. But, be warned – once you go, you’ll be hooked!!! 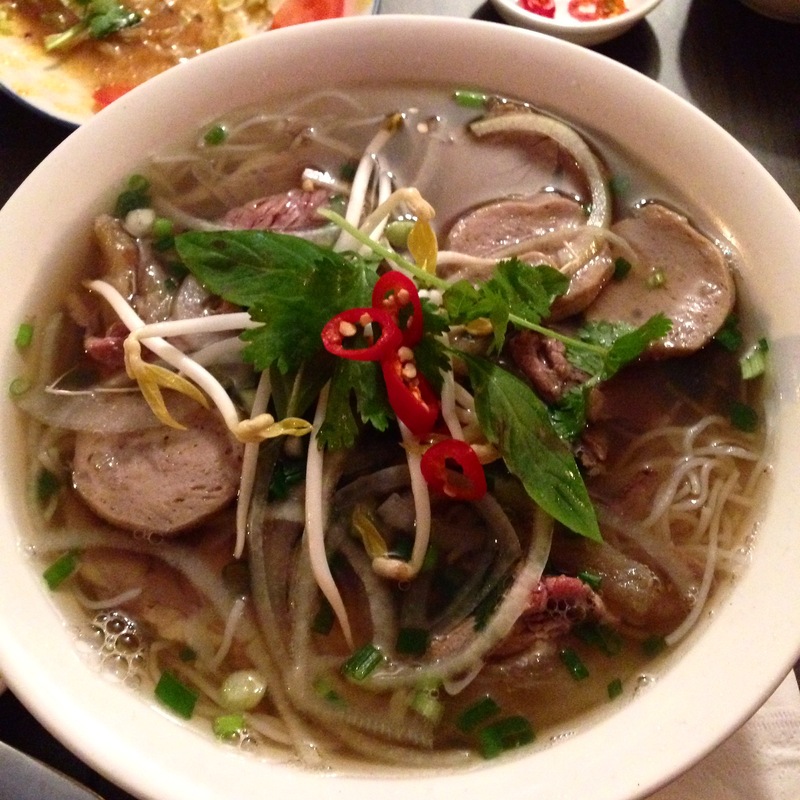 Always been a favourite of ours and its great not having to go to Regency anymore to get the best Pho in town! Great blog Jacqui makes me hungry now!